Harvesting is perhaps the most satisfying part of growing. It is also an important part of the experiment for data collection. Please read and follow the instructions here carefully to ensure that your results are accurate and comparable. 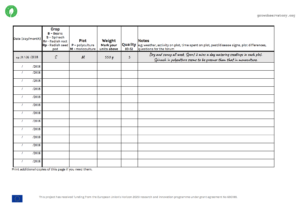 There is a printable recording sheet that you can use to make your recording easier. Harvest each crop evenly from both plots. Harvesting from only one plot will affect growth in that plot, but not the other. Begin picking the pods when they are 10cm (4in) long. Pods are ready when they snap easily and before the beans can be seen through the pod. By picking regularly you can crop plants for several weeks. Cut the beans at the stem using scissors or a sharp knife. Harvest the same proportion e.g. half of what is ready from each plot e.g. if 20 beans are ripe on the polyculture and 40 are ripe on the beans plot (and you don’t need them all now) take 10 from the polyculture and 20 from the beans. Weigh from each plot separately. Harvest the leaves continually once they’re large enough to pick. Harvest a few leaves from each plant, cutting them off low down with a sharp knife or scissors. Select the outer leaves first and allow the inside ones to keep growing. Spinach leaves are usually nicest as younger “baby” leaves and can be eaten raw or cooked. If they get a bit larger, they might be nicer cooked. Harvest the same proportion from each plot e.g. 2 leaves from each plant that is ready for harvest. You might not know it but you have two options for harvesting your radish! Roots – the round red-white root is the most commonly eaten part. You ideally want to harvest after 3-4 weeks when they are about 2.5 cm (1 inch) across. Brush away some of the soil above the root with your fingers. If the roots are too small, cover them up again and let them grow a bit more. If it is ready to harvest, hold it at the base of the leaves, just above the root, and pull upwards gently. Harvest as they become ready on each plot. This might not be the same number at the same time. Try not to harvest too early or too late from one plot and not the other. If the roots have become too large, they can go “woody” and hard and won’t be nice to eat. At this point you can leave them to grow and eat the fruits! Fruits – if you leave a radish to grow on, it will flower with clusters of white-pink flowers with four petals. Leave it a little longer and these will develop long fleshy green seed pods. These seed pods are edible (before they dry out). They taste of radish but are a little milder than the roots. You can get a lot of seed pods from a single plant so this is quite an efficient way to harvest. If you choose to leave some or all of your radish to fruit, take the same number of plants from each plot as roots and as fruits. This is the most crucial measurement in the experiment. Weigh the harvest of each, from each plot, each time you pick them. It is best to keep scales and your recording sheet or notebook near to your plots (e.g. in a waterproof container or shed). If you can, please weigh in grams as this is more precise than ounces. Beans – weigh the pods before washing. Stems should be removed. Spinach – weigh the leaves. Shake off any dirt, but do not wash them as this will make them heavier. Radish – weigh either the roots or the pods. Leaves and stems should be removed, along with the root tip. Brush off any dirt on the root, or give it a quick rinse and pat dry. Quality can be assessed against a simple scale: how much of the harvested crop (that you just weighed) is good to eat? How much is good to eat? Harvest quality – if less than perfect, what do you see as causing the problem? Weather – e.g. has it been rainy/hot since your last record? Activity – e.g. Have you weeded or watered the plot(s)? Time spent – How long have you worked on each of the four plots? Damage – Any signs of pests or disease? On which plot(s)? Differences – Are plants growing differently in each plot? Has anything else happened that could affect the plants in one plot? Questions – Anything you need to know more about – you could correspond with others doing the experiment in the GROW Experiment forum or social media. You can fill these results in on your recording sheets or a notebook. You can continue to record your data until your harvests are complete.